cbpbook.com offers jwt islamic history & culture mcqs for css pms pcs by zahid ashraf buy online with best lowest price in Pakistan with fast shipping in all major cites of Pakistan including Karachi, Rawalpindi, Sialkot, Islamabad, Gujranwala, Hyderabad, Faisalabad, Quetta, Peshawar, Multan, Larkana, Lahore, Abbotabad, Sargodha, Sukkur and many more cities in Pakistan. 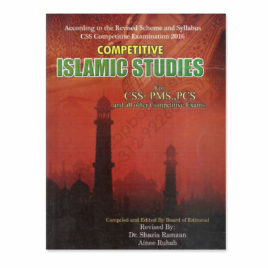 NAME Competitive Islamic Studies For CSS, PMS, PCS and all Other Competitive Exams By Dr Shazia Ramzan and Ainee Rubab AH Publisher AUTHOR Dr Shazia Ramzan and Ainee Rubab PUBLICATION AH Publisher CONDITION new cbpbook.com offers ah islamic studies for css pms by dr shazia ramzan and ainee rubab buy online with best lowest price in Pakistan with fast shipping in all major cites of Pakistan including Karachi, Rawalpindi, Sialkot, Islamabad, Gujranwala, Hyderabad, Faisalabad, Quetta, Peshawar, Multan, Larkana, Lahore, Abbotabad, Sargodha, Sukkur and many more cities in Pakistan. NAME Jahangir’s World Times Publications CSS New Exam Syllabus To The Point Islamic History and Culture For CSS, PMS, PCS and all other relevant exams By Zahid Ashraf AUTHOR Zahid Ashraf PUBLICATION Jahangir’s World Times Publications CONDITION new cbpbook.com offers to the point islamic history and culture for css pms pcs by zahid ashraf buy online with best lowest price in Pakistan with fast shipping in all major cites of Pakistan including Karachi, Rawalpindi, Sialkot, Islamabad, Gujranwala, Hyderabad, Faisalabad, Quetta, Peshawar, Multan, Larkana, Lahore, Abbotabad, Sargodha, Sukkur and many more cities in Pakistan. NAME Advanced Islamic Studies MCQs for Lecturer, Assistant Professor, Subject Specialist, CSS, PCS, PMS, MA, BS(Hons), University Entry Tests, NTS and all other allied examinations LOOK INSIDE AUTHOR M. Imtiaz Shahid & Attyia Bano PUBLICATION Advanced Publisher CONDITION new cbpbook.com offers advanced islamic studies mcqs by m imtiaz shahid & attyia bano buy online with best lowest price in Pakistan with fast shipping in all major cites of Pakistan including Karachi, Rawalpindi, Sialkot, Islamabad, Gujranwala, Hyderabad, Faisalabad, Quetta, Peshawar, Multan, Larkana, Lahore, Abbotabad, Sargodha, Sukkur and many more cities in Pakistan. NAME Jahangir’s World Times Publications Revised and Updated Edition Constitutional Law for CSS, PCS, LLB, LLM and All Other Relevant Exams By Raheem Baksh Maitlo LOOK INSIDE The book is a comprehensive discourse on almost all important topics of "Constitutional Law" and on the questions which have been put frequently in CSS Examination. The book has been written keeping in view the syllabus of Central Superior Services Examination by the Federal Public Service Commission. AUTHOR Raheem Baksh Maitlo (PAS) PUBLICATIONS Jahangir’s World Times Publications CONDITION new cbpbook.com offers constitutional law by raheem baksh maitlo jahangir world times buy online with best lowest price in Pakistan with fast shipping in all major cites of Pakistan including Karachi, Rawalpindi, Sialkot, Islamabad, Gujranwala, Hyderabad, Faisalabad, Quetta, Peshawar, Multan, Larkana, Lahore, Abbotabad, Sargodha, Sukkur and many more cities in Pakistan.